Many of Iran’s once flourishing wetlands have dried dramatically in recent years. 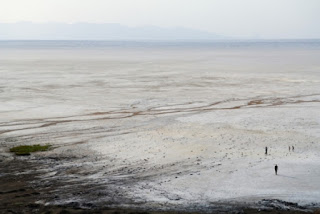 Lake Urmia in particular, the sixth largest salt lake in the world and a UNESCO Biosphere Reserve, is dangerously receding and threatens to vanish entirelly. Spanning an area larger than the Dead Sea and the Great Salt Lake combined, the dwindling lake lies tucked in the Zagros Mountain range in northwest Iran near the Turkish border. Hossein Akhani, a biologist at the University of Tehran, argues that Iran’s high water consumption and energy and agriculture demands put pressure on the lake. Disturbing photographs of the lake today compared to two decades ago show that now the southern half completely evaporates in summer. Plants, migrating birds like flamingos and pelicans, a unique species of brine shrimp, and other wildlife have begun to disappear. Akhani, a longtime advocate on conservation issues, argues that people should take emergency actions to stop the lake from contracting further. Only then, he says, can Iran try to bring water back—from dams, river flow, and treated wastewater—to replenish, revive and restore the lake to its natural state. He believes efforts to save it will be more fruitful as the international community lifts sanctions, following successful negotiations involving Iran’s nuclear program last year. As restrictions ease, Akhani says, there should be more opportunities to collaborate among scientists, conservationists, and international organizations. How will the lifting of the sanctions aid these efforts to restore the lake?When the sanctions are lifted, there will be more opportunities for cooperation between Iranian and international scientists. Then we can learn more from [similar water problems] in the States. The new era will also help restoration programs. Environmental conditions in Iran became worse after the revolution, because of sanctions and the eight-year war in Iran and Iraq. I’m sure that if relations between Iran and the world improve, then there will be chances for foreign investment in the country, implementing new jobs for people, and supporting industries that reduce pressure on the environment. Environmental problems are world problems, and the world should work together to solve them. But sanctions make them worse, when you can’t import necessary technologies, talent or manpower. Are people in other countries trying to help in some way? 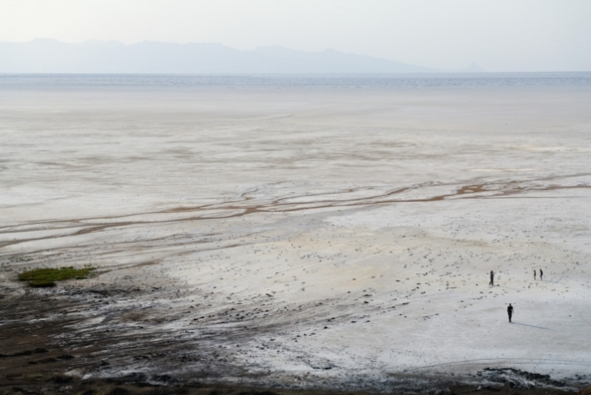 In recent years, the case of Urmia became more publicized in international media and generated interest among scientists and international organizations. For example, Japan invested $1 million in the area to improve agricultural management. Several international meetings took place in Iran, and even scientists from the United States came. The Iranian government is very open and welcomes any kind of contribution. Instead of criticizing Iran, the world should do something! It’s the duty of developed countries that have more scientific facilities and funding to help. What are your thoughts about how things will change after the sanctions are lifted, especially for Iranian scientists and science in Iran? Iran’s education and universities expanded in the last 20 years. There are more than four million students in Iranian universities and the number of scientific publications in Iran has increased. But during the sanctions, we couldn’t get equipment and didn’t have opportunities to participate in international conferences, and exchanging students became difficult. Lifting sanctions will be beneficial for Iranian universities and universities in developed countries. We have seen thousands of Iranian scholars [working] in the United States and Europe. Iran is a huge country and provides a unique platform for top researchers, especially in fields of photosynthesis, plants, adaptation to harsh environments, and other environmental and biodiversity issues. When the economic situation and the stability in the area improves, our educated students should have opportunities to stay, too. Are there other things that you’ve been thinking about lately or that you look forward to after the sanctions? Our big concern now is that [U.S.] Republican presidential candidates say that if they’re elected, they will cancel these agreements. This would disturb an achievement that cost decades of negotiations. We should not destroy what has been planted—such a very expensive cultivation. I hope we’ll always think that relations and cooperation are the best solution for solving problems. How long do we have to have conflicts? We are big nations! Not all Iranians love America—but they have a lot of enthusiasm for development, a better life, and to be in contact with the world. We have to try to respect each other in spite of our differences. He is spot on and I hope sanity will ultimately prevail this election cycle here in the US. The journal publishers take a very different view. “I'm all for universal access, but not theft!” tweeted Elsevier's director of universal access, Alicia Wise, on 14 March during a heated public debate over Sci-Hub. “There are lots of legal ways to get access.” Wise's tweet included a link to a list of 20 of the company's access initiatives, including Share Link. But in increasing numbers, researchers around the world are turning to Sci-Hub, which hosts 50 million papers and counting. 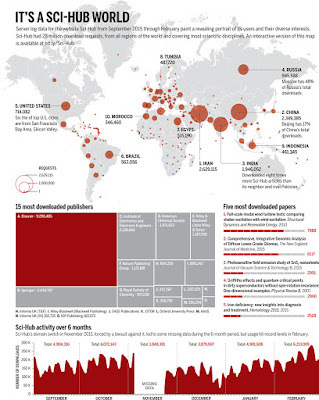 Over the 6 months leading up to March, Sci-Hub served up 28 million documents. More than 2.6 million download requests came from Iran, 3.4 million from India, and 4.4 million from China. The papers cover every scientific topic, from obscure physics experiments published decades ago to the latest breakthroughs in biotechnology. The publisher with the most requested Sci-Hub articles? It is Elsevier by a long shot—Sci-Hub provided half-a-million downloads of Elsevier papers in one recent week. by gods or magic.” She was hooked. At university in the Kazakh capital, she discovered a knack for computer hacking. It appealed to her because “unlike higher programming languages that are created by people and are volatile,” making and breaking computer security systems requires a deeper knowledge of mathematics and the primitive “assembly language” that computers use to move information. 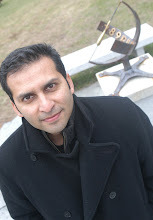 Elbakyan did find a community of like-minded researchers in transhumanism, a lofty field that encompasses not just neuroscience and computer technology but also philosophy and even speculative fiction about the future of humanity. She discovered a transhumanism conference in the United States and set her heart on attending, but she struggled to get a U.S. visa. She was rejected the first time and only barely made it to the conference. With the remainder of her summer visa, she did a research internship at Georgia Institute of Technology in Atlanta. When she got back to Kazakhstan, frustration with the barriers that scientists face would soon lead her to create Sci-Hub—an awe-inspiring act of altruism or a massive criminal enterprise, depending on whom you ask. Publisher paywalls are the bane of scientists and students in Kazakhstan, she says, and the existing solution was cumbersome: Post a request on Twitter to #IcanhazPDF with your email address. Eventually, a generous researcher at some university with access to the journal will send you the paper. For Elbakyan herself, the future is even more uncertain. Elsevier is not only charging her with copyright infringement but with illegal hacking under the U.S. Computer Fraud and Abuse Act. “There is the possibility to be suddenly arrested for hacking,” Elbakyan admits. Others who ran afoul of this law have been extradited to the United States while traveling. And she is fully aware that another computer prodigy–turned-advocate, Aaron Swartz, was arrested on similar charges in 2011 after mass-downloading academic papers. Facing devastating financial penalties and jail time, Swartz hanged himself. Just how Yahyanejad has funded that project isn’t exactly clear, particularly its more than $100,000-a-year in satellite rental fees. He says only that Net Freedom Pioneers receives a combination of private donor and government funds. Yahyanejad declines to say which governments, but emphasizes that only his group’s staff has any say in what materials are included in Toosheh’s daily bundles of digital content. I think this is it for stories about Iran in this post - unless you want to keep up with the predictable Congressional politics about the nuclear deal with Iran. For insanity, you can read Ted Cruz's oped in today's NYT: The Mullahs and their Missiles. Or for some semblance of sanity, you read about a Senate vote to block blocking of Iran's nuclear deal. Olivier Roy on "The Strategic Limits of ISIS"